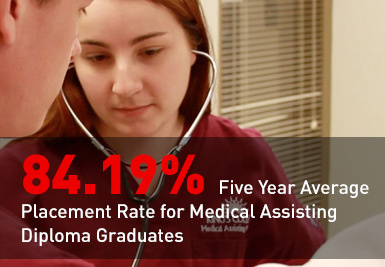 Medical Assisting is projected to be among America’s fastest-growing occupations through the year 2026 with an expected national job growth of 29%.2 If you enjoy caring for others, being a medical assistant can be an incredibly rewarding career. Click the buttons below to learn more about our on-time graduation rates, the median debt of students who completed the program, and other important information. Click the tabs below to learn more about our 10-month diploma and 16-month Associate of Applied Science degree in medical assisting program. Our Medical Assisting graduates receive hands-on training in simulated medical laboratory classrooms. Each lab is equipped with the same types of medical equipment used in physicians' offices. You will spend most of your time taking classes that directly pertain to the medical assisting career, enabling you to complete the program in as little as 10-16 months. 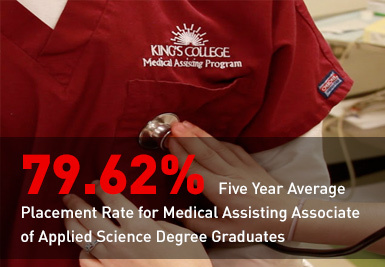 Graduates of King's College's medical assisting program qualify to take the Certified Medical Assistant (AAMA) test. During your training at King's College, you will be exposed to a wide knowledge base and be given plenty of hands-on experience, all in a shortened time frame. As part of our commitment to helping you find a job after graduation, King's College goes a step above and prepares you with networking techniques, a professional resume, and the necessary interviewing skills so you have what you need to succeed. The medical assisting curriculum is designed to give you plenty of hands-on clinical, laboratory and administrative training throughout the 10-16 month program. The King’s College Medical Assisting programs are accredited by the Commission on Accreditation of Allied Health Education Programs (www.caahep.org) upon the recommendation of the Medical Assisting Education Review Board (MAERB). The address and telephone number of the Commission on Accreditation of Allied Health Education Programs are 25400 US Highway 19 North, Suite 158, Clearwater, FL 33763 (727-210-2350).